Quick! Can you name a beautiful ornamental succulent plant that somehow belongs in the same family as hyacinth and asparagus? 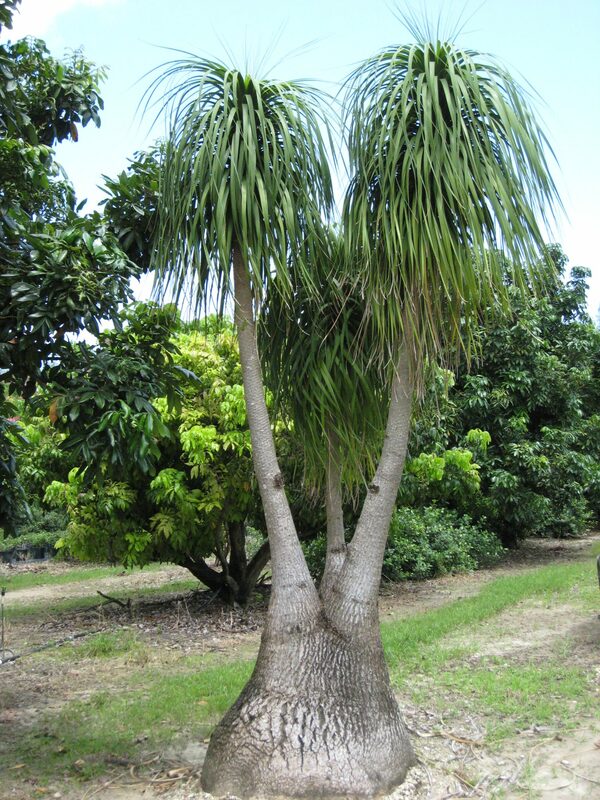 Our choice is Beaucarnea recurvata, a uniquely constructed tree native to arid areas of southeastern Mexico. 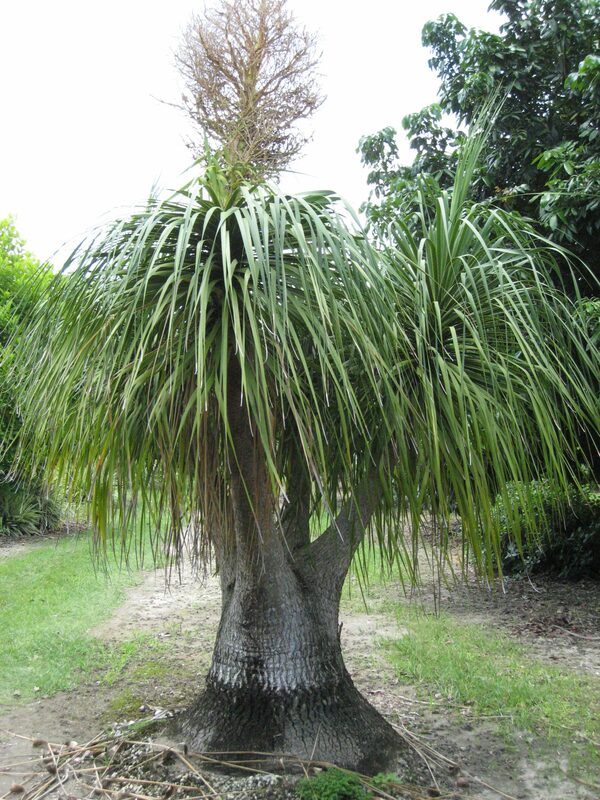 Where it’s native, Beaucarnea can reach 30 ft. high after many years, but in cultivation tends to stay shorter. It starts life as a single-trunked plant, but as it grows may develop several upright branches, each topped by a rosette of flat, long, narrow ribbon-like leaves. 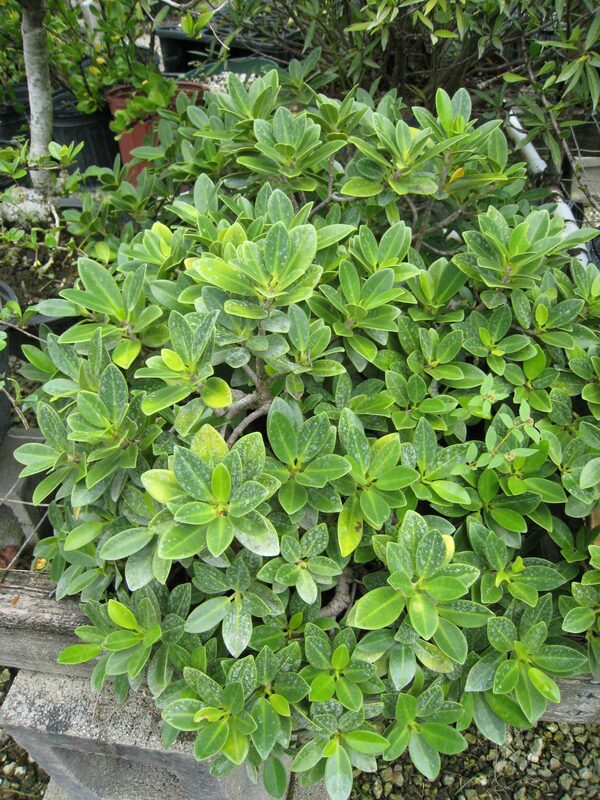 Upon maturing, it produces creamy-white flowers on a stalk extending above each tuft of leaves. At the opposite end of the plant is another distinctive feature — a swollen base, or caudex, vaguely resembling an elephant’s foot. 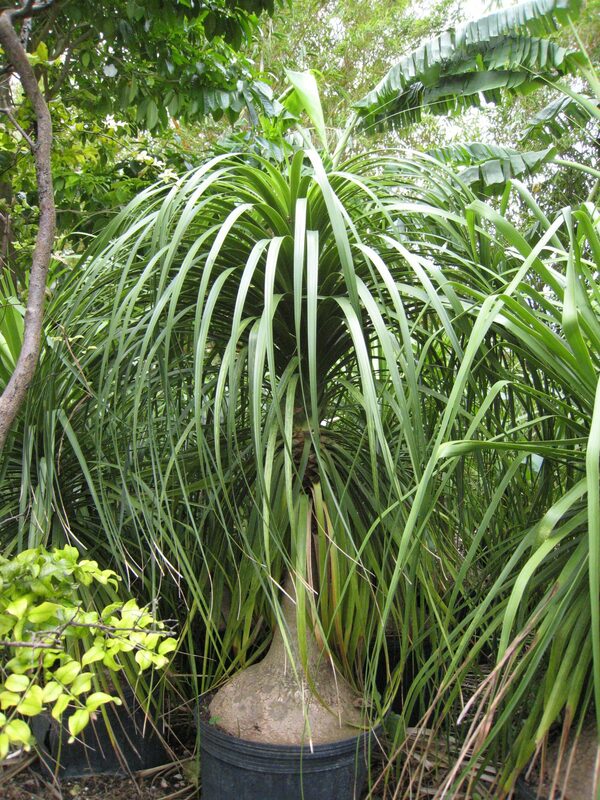 The purpose of this structure is to store water, and therein lies a clue as to Beaucarnea‘s cultural preference: It thrives in sunny, dry conditions. Fortunately, it tolerates southern Florida’s climate perfectly well as long as it is planted in a well-drained site. 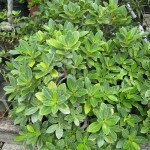 It is also capable of thriving in container culture for many years, and its size can be moderated by keeping it potted. 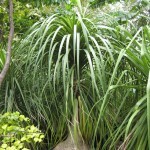 Beaucarnea can be grown successfully indoors, provided that it is kept near a source of strong light and that watering is drastically reduced. 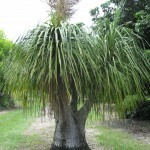 Beaucarnea recurvata is often called the Ponytail Palm, but, aside from also being a monocot, it is not related to palms. You can find this very interesting tree here at the nursery in 7-gallon containers, as well as large field-grown specimens. 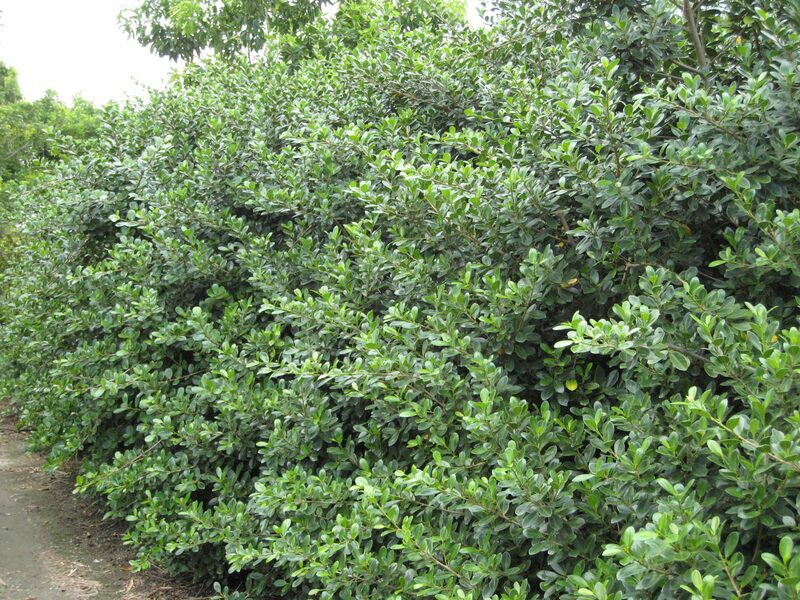 In our part of the world, the genus Ficus has gotten a rather mixed reputation, primarily because some species have aggressive root systems than can raise sidewalks, crack foundations and clog underground pipes. But not all of the 800 or so species of this genus present such risks. 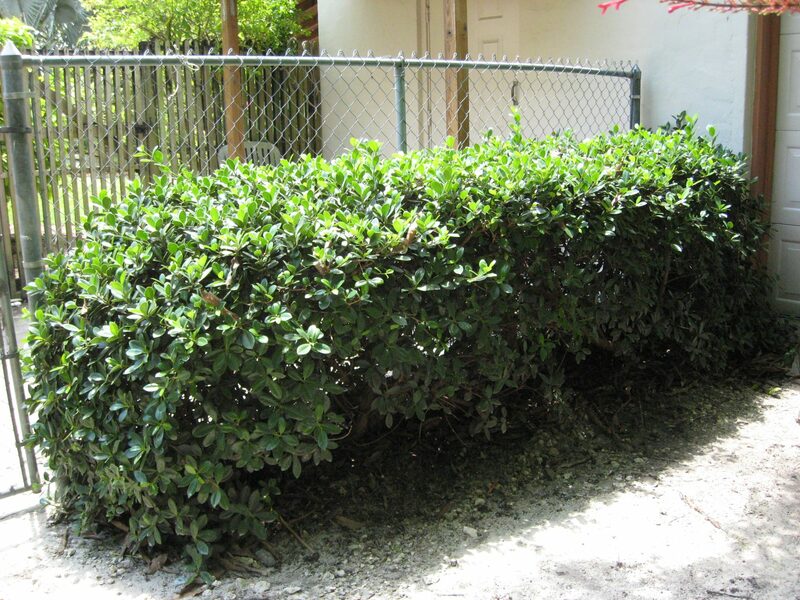 One that is especially useful in the landscape of southern Florida is Ficus microcarpa ‘Green Island’, a very attractive shrub that grows slowly and benignly here. It is known for its friendly roots. 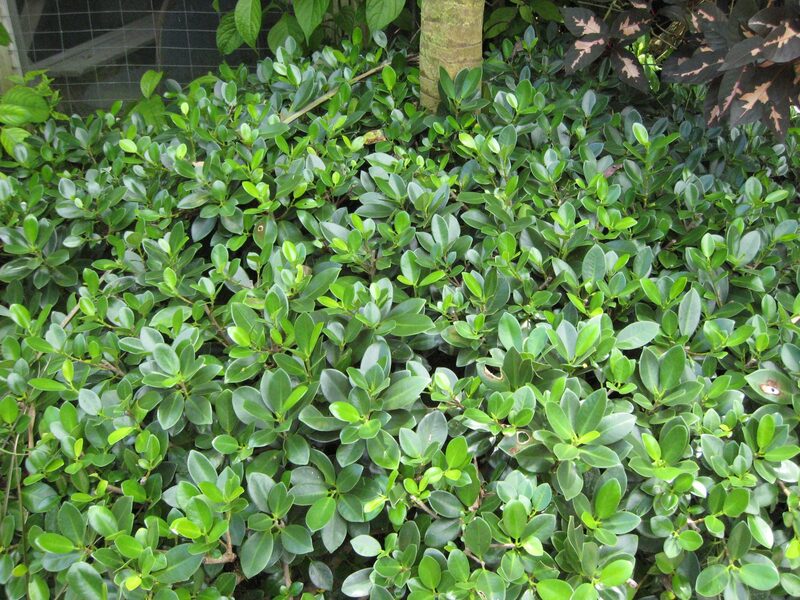 Its glossy green leaves have lots of ornamental appeal, and it neither requires frequent watering nor is particular about soil type. 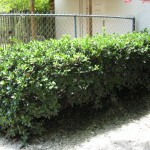 Left alone, it will reach 8 ft. in height, but with periodic shearing it can be maintained as a nice ground cover. 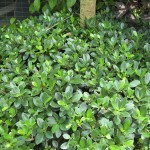 The Green Island Ficus is even capable of being grown as a house plant or as a Bonsai specimen. 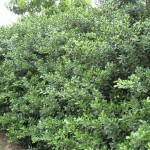 Please drop by the nursery and evaluate the Green Island Ficus first-hand. We have them in 3- and 15-gallon containers. About 35-40 years ago, a Miami couple fresh from a long trip to Asia brought seeds of an attractive Indian evergreen tree to Fairchild Tropical Garden. Over time this species, Polyalthia longifolia (a/k/a P. longifolia var. 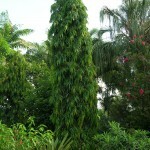 pendula), has proven to be a very successful introduction to the landscape of southern Florida. 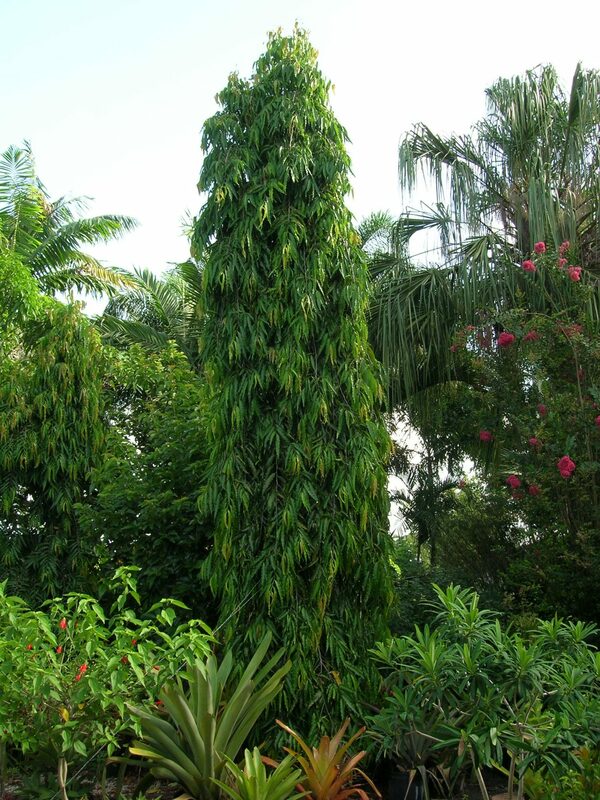 Commonly known as the Mast Tree, it is pyramidal – or spindle-shaped – and capable of reaching 30+ ft. in height. 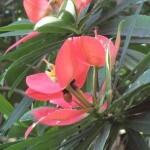 It features long drooping branches and dark green lance-shaped glossy leaves with undulating margins. Polyalthia provides an excellent alternative to Italian Cypress, which in southern Florida is prone to spider mites and fungal disorders. 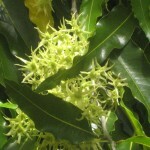 In the landscape of bustling Asian cities, the Mast Tree is often used to soften noise. 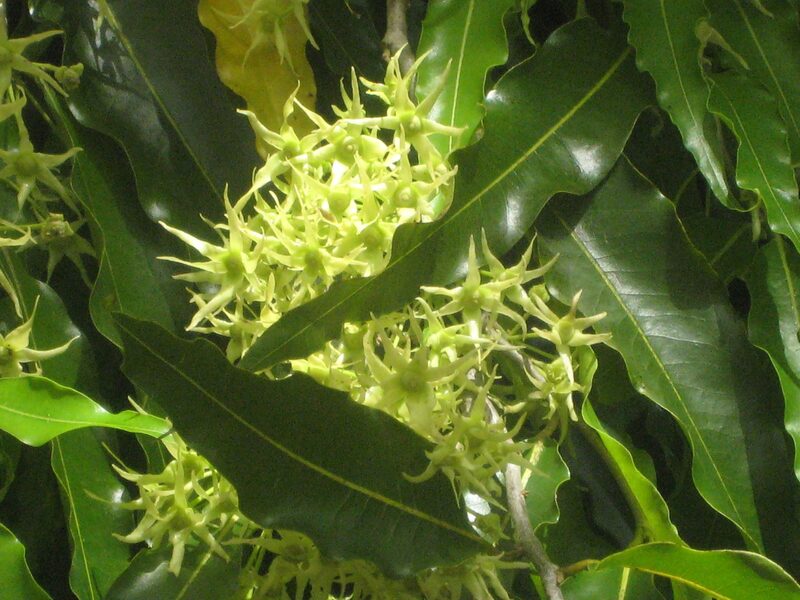 Aside from its ornamental appeal, Polyalthia is said to contain medicinal properties. Studies reputedly confirm antifungal and antibacterial capacities, as well as usefulness in combating ulcers, fever, hyper-tension, diabetes, and certain cancers. 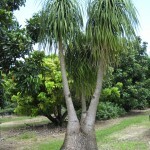 At the nursery, these handsome trees are available in 3- and 15-gallon sizes. If you’ve ever visited Richard Lyons Nursery in Miami, you already know that it’s a very friendly place. 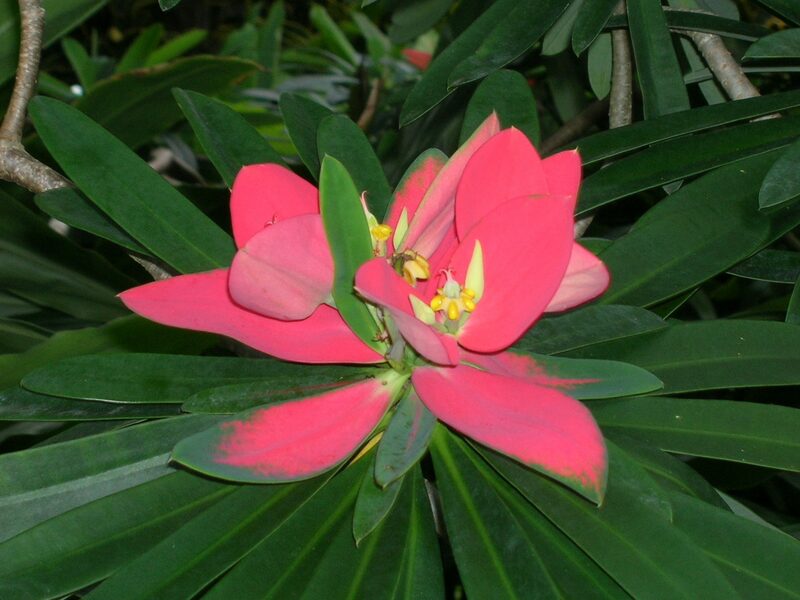 We want to help you find just the right plants and trees for your own tropical paradise because we share your passion for tropical plants, fruits and trees. The conversation doesn’t end when you leave our Nursery because we’re social. You can be our fan on Facebook or follow the Nursery on Twitter too. We would love to know how you found our plant nursery. Please tell us when you visit, whether you heard from a friend or read a review on Yelp.com. It would also be great if you take the time to check in with your favorite social website when you visit. We currently offer discounts and specials for users on Yelp! and foursquare. If you use another network to share with your friends, tell us about that too. We love hearing about new ways to stay in touch with you. Finally, keep watching this website grow. We have lots of things to share with you from beautiful blooms and tasty fruit to gardening tips and tricks to make your personal oasis bloom. 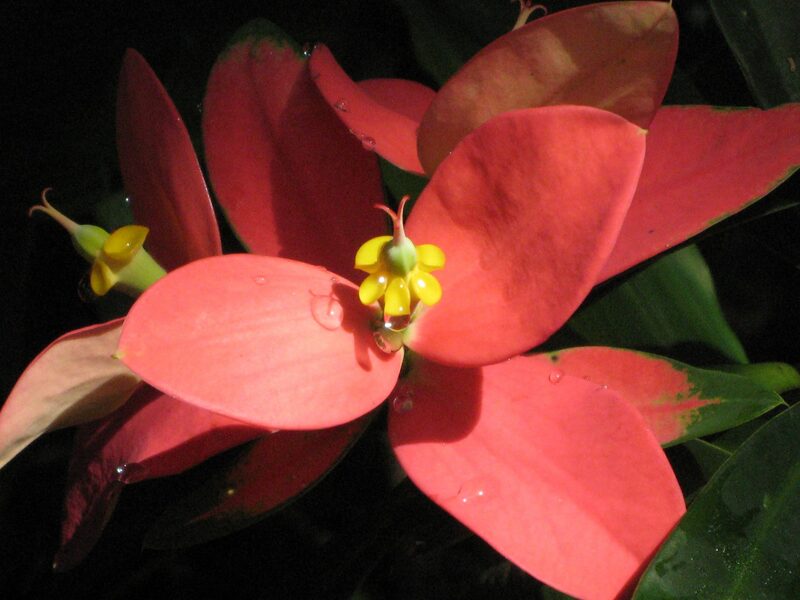 The Jamaican Poinsettia is native to Jamaica, and a relative of the Christmas Poinsettia. 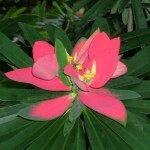 Unlike the poinsettia you buy at Christmas, this large shrub or small tree, 12-15′, flowers year round. 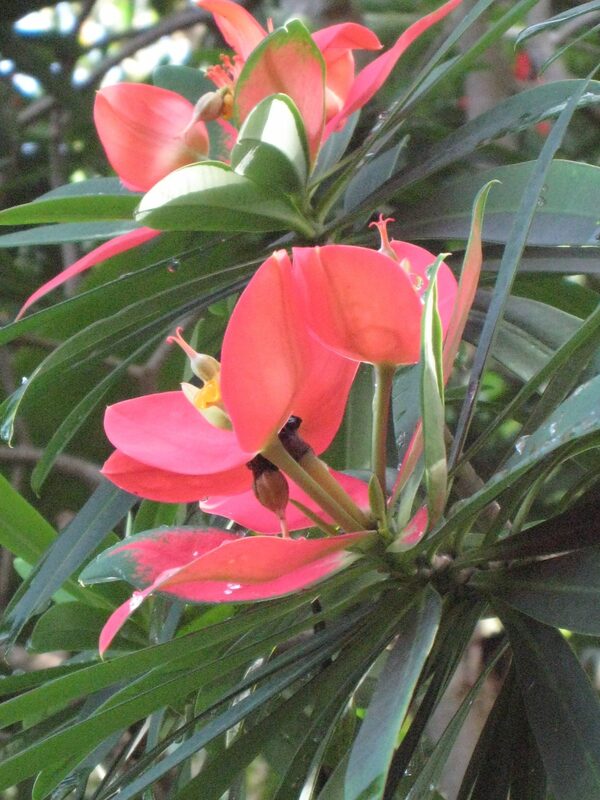 In Jamaica, this small tree grows in limestone soils with little rainfall, so it makes an ideal candidate for S. Florida, when planted in a sunny location. 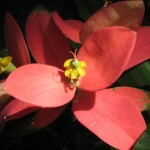 We have various sizes ranging from small seedlings to flowering size specimens. Come take a look at one growing in the ground to give you an idea what to expect.